Sunshine Coast Airport, Tourism Noosa and Visit Sunshine Coast have signed a historic Aviation Partnership agreement that will see the three organisations combine forces to develop and implement a new marketing plan to drive future tourism growth into the region. 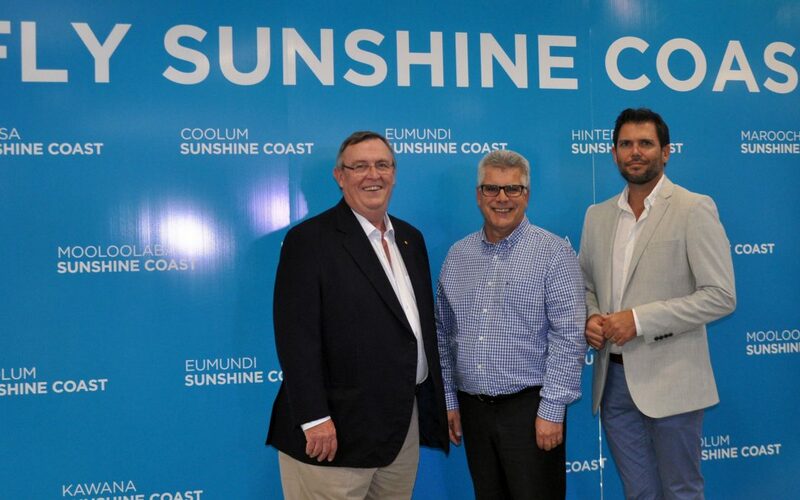 The agreement was announced today by the three parties at the Sunshine Coast Airport. The three-year Aviation Partnership involves the three equal partners pooling $400,000 annually in marketing funds to grow business from the key interstate markets of Sydney, Melbourne and Adelaide, along with New Zealand. It will target routes that are identified as having potential to generate sustained growth and regional dispersal. Visit Sunshine Coast Chair, David Ryan, said the Aviation Partnership was a landmark agreement by the organisations that would bring benefit to tourism operators across the region. “It is very encouraging that we have been able to combine our efforts with Tourism Noosa and Sunshine Coast Airport because while the region has enjoyed record domestic and international visitor arrivals in the past year, the redevelopment of Sunshine Coast Airport offers unique opportunities to accelerate growth, and requires a coordinated and concerted approach. Tourism Noosa Chair, Steve McPharlin, said that the formation of the partnership demonstrates a collaborative vision by all parties. Sunshine Coast Airport GM, Peter Pallot, said the partnership represents a powerful strategic alliance to grow tourism in both our domestic and international markets. “The expansion of Sunshine Coast Airport will remove the constraints of our existing runway, support growth in our existing markets and provide the opportunity to grow new interstate and international markets. Tourism and Major Events Minister Kate Jones said she looked forward to working with the group to provide more opportunities to stimulate tourism on the Sunshine Coast. “Supporting the tourism industry on the Sunshine Coast to grow is a priority for this government,” Ms Jones said. “In the year to June 2017, 3.4 million people from around Australia visited the Sunshine Coast – up 4.9 per cent from the year before. A record 3.4 million domestic arrivals and 12.4 million visitor nights (up 4.4%) for the 2016-17 year, on the back of strong increases in the interstate market (up 13.9%). The record visitor numbers contributed $2.06 billion to the Sunshine Coast economy. The Sunshine Coast Airport Expansion Project includes the construction of a new 2450m runway and upgrade of terminal and apron facilities. The project is scheduled for completion in 2020.